"And a Curse, and Love, and Betrayal" aka "I klatwa, i milosc, i zdrada" is the biggest fan-made module for "The Witcher". - the estimated total word count of 125000. Geralt is looking for Yennefer. He comes to a small village and gets two contracts: a young woman wants to remove a curse from her lover who turns into a wolf at day and the chief of the village wants to clean up the local gold mine of all the monsters. "I klatwa, i milosc, i zdrada" to najwiekszy nieoficjalny dodatek do gry "Wiedzmin". Geralt poszukuje Yennefer. Przybywa do niewielkiej wioski i otrzymuje dwa zlecenia: pewna dziewczyna chce, zeby zdjal klatwe z jej ukochanego, przemieniajacego sie za dnia w wilka, a soltys pragnie, by wiedzmin oczyscil miejscowa kopalnie zlota z potworow. "And a Curse, and Love, and Betrayal" Is Released! We would like to announce that "And a Curse, and Love, and Betrayal", one of the biggest fan-made adventures for "The Witcher", is available for download. It took us almost three years to finish it. We want to thank everybody who was involved in our project and we wish all players lots of fun! And a Curse, and Love, and Betrayal, version 1.2.1, English and Polish. I klatwa, i milosc, i zdrada wersja 1.2.1. A guide to "The Enchanted Circle", the most complex side quest in the adventure. This is the newest version of the guide, it was revised in June 2011. This is a guide to monsters and some side quests in the adventure "And a Curse, and Love, and Betrayal". The guide is in English. The story no fairy tale but a complex "realistic" Witcher-style story in which decisions count and might change everything. To all who made this: THANK YOU VERY MUCH! 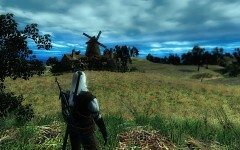 *Hint to players: Difficulty is quite higher than in the main Witcher 1 game. A drowner is a fearful opponent, get used to it, cope with it and enjoy the thrill. Looks like this is very well done and has a lot of places to explore/people to talk to/quests to do, although I haven't played much other than the first 20 minutes 3 times on Difficult and Medium difficulty settings until I get to any monster and die. Yes, the combat is hard, but it's possible to play the adventure even on higher difficulty settings. "A guide to monsters and three side quests" contains useful combat tips. I`ll definitely play this when I install Witcher again. is there any news yet ? The whole adventure has just been translated into English and now it's undergoing proofreading and testing. It will take some time - the end of April is an estimated time of release, but I hope it will be much sooner. Człowieku, to jest zajebiste! This is awsome! when will the english version come out ?! Probably in the spring or in the summer.